The evil K. Rool and his kremlin army have stolen all of the bananas in the jungle. It's up to Donkey Kong and Diddy Kong to get them back! This is an extremely fun platforming game that has over 30 unique levels as well as an interesting buddy system where you can freely switch between the two Kongs to help you progress through each level! Donkey Kong can ground pound which can reveal hidden items and can defeat large enemies. Diddy Kong can't, he can run faster and jump further than Donkey Kong though! 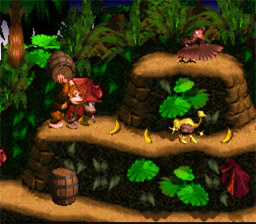 Another unique feature in the DKC series are the animal buddies. Each of them help out with thier unique abilities. For instance, Engarde the swordfish can harpoon underwater enemies with his nose and Rambi the rhino can defeat enemies and bust open walls revealing hidden passageways by charging towards them! This game has mind-blowing graphics for a game released in the early 90s as it was one of the first games to use 3D sprites on character models as well as the background scenery and frankly is still impressive to this day! The music is just awesome and is some of the best music you'll hear on an (SNES) game (especially the underwater ambience theme)! Bottom line: This is an awesome platformer with gameplay that is both unique and enjoyable, excellent graphics that still manage to impress and "Funky" music that compliments the game nicely. It's well worth 800 Wii Point! This was the game that proved who was the king of the jungle! At the time Donkey Kong Country was released there was really only one direct competitor for Mario in the platformer genre and that was Megaman but when Donkey Kong Country was released it changed the way developers made platformers such as making a minecart level or something similar in almost every platformer since or making complex levels that require more than just jumping across holes! I couldn't agree more Killeryoshii. I can't believe I haven't looked at this review until now. This old review needs some pics. Sort of on the short side though. I know this is one of my older reviews, and I wasn't good at all back then, but you can post a second impressions review if you want. I know what I'm doing now. I'm looking forward to it, oh and maybe since this is review is in the virtual console review section, maybe yours should be in the Retro review section. Right. I'll also add somewhere "Second Impression" so it doesn't confuse people. It's unfortunate that such a good game has been remove from the Wii Shop. If we had been given some type of notification from Nintendo that the Donkey Kong Country trilogy was going to be removed, I would've at least been able to download the original. I guess Donkey Kong won't ever be making an appearance on my Wii Virtual Console, because I could really care less about the arcade game. Especially when I've already downloaded Donkey Kong 94. Thanks, Nintendo! You have nobody but yourselves to blame for this bad customer service. I wonder why this game was removed from the Wii's VC?